Physical Days Bern 2017 took place from July 10-14, 2017. Workshops with Kristina and Sadé Alleyne. Physical Days Bern 2016 took place from August 01-05, 2016. 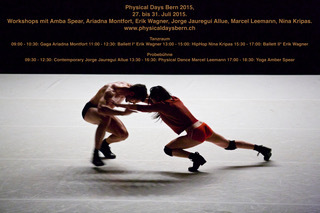 Physical Days Bern 2015 took place from July 27-31, 2015. Workshops with Amba Spear, Ariadna Montfort, Erik Wagner, Jorge Jauregui Allue, Marcel Leemann, Nina Kripas.